One week ago, an Australian research firm emailed reporters a study showing speed limits should be raised in the name of safety. Jalopnik and several other sites wrote about it. Yesterday, we learned it was a hoax. The bylines of Top Gear hosts should have been a tip-off. 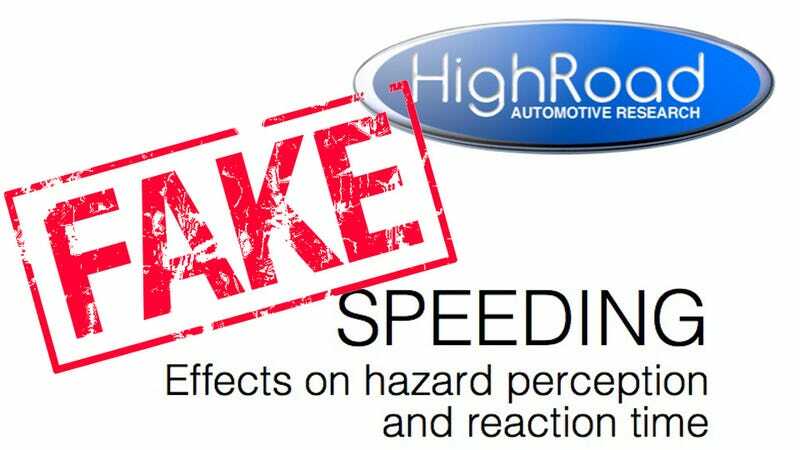 The study by "High Road Automotive Research" was emailed last week to several outlets. The piece was well-designed to resemble a typical auto research firm's work, including contact information for spokeswoman Jane Hannity, in Australia. The report contended that speed limits should be raised because driving faster made for more attentive, safer drivers. The release also included links to a website, highroadauto.org, that highlighted other research done by the outfit, such as "Hybrid Propulsion System Modeling and Engine-In- the-Loop Integration." But a closer look at the study quickly reveals something's wrong, especially with the amalgam of "Top Gear" stars' names in the study's author list. The citations page also includes several made-up names — "Tiff Hummer," "Ed Nissan," "Chris Volks, Professor William Wagon, and Professor Alex Lotus" — that don't pass the smell test. Digging a little deeper, one finds the High Road site has existed for less than a week, and that it's those other studies were copied from actual researchers at other firms, with some references removed to hide their origins. Calls and emails to Hannity's contacts have not been returned. A spokeswoman for "Top Gear Australia" told the Sydney Morning Herald that it had nothing to do with the hoax. We similarly spoke to a writer for "Top Gear UK" who responded back with "Eh?" We'll cop to being had — as others have — but wondering what for, as this punchline's ended with more of a fizzle than a bang.